On the Strida rack panniers will not work. The rack is to small and I got problems with my feet. Here is a special Strida bag that sits on top of the rack, but this is a small bag. It can contain some repair stuff and energy bars but not more. I use a Brooks Flyer Special saddle with loops on my Strida. Looking around I found the classic, handmade Carradice saddle bags. I got two of them: a Camper Longflap and the small Junior. I love the look and the material. The Camper Longflap is a 24 liter monster. 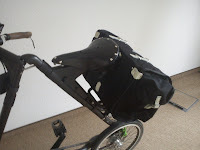 If you want do do lightweight touring, this bag should be able to contain all you need. Its flap has a folded extension, providing even more space. On the saddle loops the bag is near to my own body so its weight is not distracting me. By default leather straps are used to attach the bags to the saddle loops. This is a secure way to hold them but you have to open the flap and the leather straps to detach the bag. This is not that much of an issue because mostly you can keep them on the bike. It doesn't affect the folding. The Junior is the smallest saddle bag of the line. Unlike the Camper is has no side pockets. A shoemaker added some d-rings for a strap for me. So I can use it with a shoulder strap, too. The bags are made from waterproof cotton duck. It got to test in with really heavy rain last month and the keep my stuff perfectly dry.